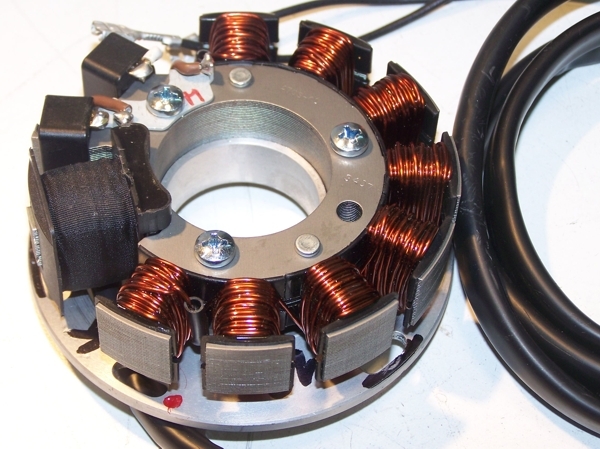 If you can install and time a stock ignition and possess basic mechanical skills, you can install a Powerdynamo! If you never have worked on your ignition, better have it done by someone who knows. Powerdynamo can not monitor the compliance to those instructions, nor the conditions and methods of installation, operation, usage and maintenance of the system. Improper installation may result in damage to property and possibly even bodily injury. Therefore we assume no responsibility for loss, damage or cost which result from, or are in any way related to, incorrect installation, improper operation, or incorrect use and maintenance. We reserve the right to make changes to the product, technical data or assembly and operating instructions without prior notice. Please bear in mind that any modification of the material as well as own repair attempts which have not been agreed with Powerdynamo may result in a loss of warranty. Do not cut off wires. This leads to a loss of reverse polarity protection and often results in damage to electronics. Also, please take note of the information provided on the information page for this system. Check that what you have bought really corresponds to the motorcycle you have. Wrong ignition settings may damage your engine and even hurt you during kickstart (violent kickbacks). Be careful during the first test runs. If needed change settings to safer values (less advance). During assembly check carefully that the rotor (flywheel) does not touch the stator coils or anything else, which may happen due to various circumstances and lead to severe damage. 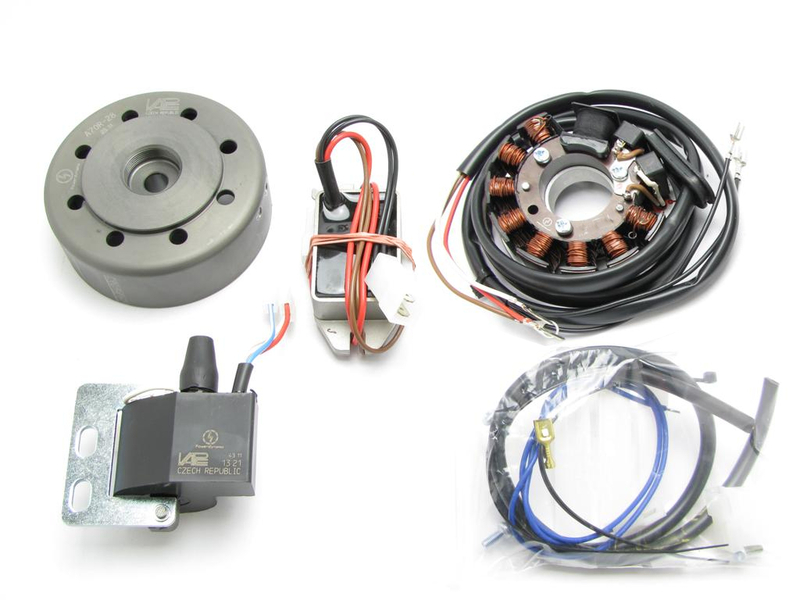 This system is designated to replace stock dynamo/alternator & ignition systems in vintage and classic motorcycles whose engine characteristics have not been modified aftermarket. This system is not a tuning system and it will not bring significant increases in engine output. It does however significantly enhance roadworthiness and comfort by offering better lighting, better function of side indicators and horn and, compared with the aging stock systems, increased reliability. As our system does not tamper with engine characteristics it does not increase emission of gaseous pollutants and noise. In most cases emission of pollutants should even be reduced due to better combustion. If used as designated the system therefore will not normally infringe the existing legal status of the motorcycle (this statement is valid for Germany, for other countries, please check locally against your road licensing regulations). This system is not suitable for use in competition events. If used other than the designated way, warranty will be voided and it might well be that you do not obtain the desired results or, worst you loose legal roadworthiness. The charging system is only suitable for use with rechargable 12V (6V systems 6V) lead-acid batteries with liquide electrolyte or sealed lead-acid batteries, AGM, Gel. It is not suitable for use with nickel-cadmium, nickel-metal-hydride, lithium-ion or any other types of recharchable or non rechargable batteries. This is a replacement system and not a copy of the stock material. The parts in this system therefore look different and might fit differently (notably ignition coil and regulator) requiring some adaptation by you. During assembly imperatively start with assy of engine based parts to see that those really fit before you start fitting the external parts. In many cases customers assemble those first and thereby often modify them in breach of warranty which renders them unfit for renewed sale. Replacing old ignition systems is not a matter of taking something from a supermarket shelf as there have been very many types, versions and possibly unknown aftermarket modifications which harbour plenty of room for error. Our systems are NOT tested for use with third party electronic devices (such as GPS, mobile phones, LED lighting etc)and may cause damage to such parts. Possibly existing electronic tachometers will not work with the new system. Read our information for suitable solutions. Possibly existing safety switches and electronic valve controls are not supported. It might be that your motorcycle was originally equipped with an ignition that did limit top speed for legal reasons. The new system does not have such a facility, so check your legal situation beforehand. If you have no expertise for the installation have it done by an expert or at a specialist's workshop. Improper installation may damage the new system and your motorcycle, possibly even lead to bodily harm. Before you order a system, please check whether a puller tool for the new rotor is included in the kit. If not, better order it at the same time. You might want to order light bulbs, fuse, horn, flasher unit etc. Never use anything other than the recommended puller tool to pull the new rotor again. Damage to the rotor as a result of use of other tools or methods is not covered by warranty. The rotor is sensible to blows (including during transport). Before assembly, please always check for damage (on rotor without magnet plastification try to push the magnets aside with your fingers). After impact the glued in magnets might have broken loose, sticking to the rotor solely by magnetic force, so that one does not notice right away. During engine run the damage would be considerable. Before placing the rotor onto the engine, please make sure that its magnets have not collected any metal objects such as small screws, nuts and washers. That equally would lead to severe damage. To pull the new rotor again, you will need a puller tool M27x1,25 (part-no. : 99 99 799 00 -Not provided!-). Note: Never use a claw puller, a hammer or any other device, that will shake the magnets off. Make sure your motorcycle rests securely, preferably on an elevated work bench and that you have good access to the dynamo side of the engine. Disconnect all wires to the old dynamo, regulator and ignition coils and take those parts off. Take the woodruff key from the crank pin. It will not be needed anymore and prevent assembly. If you forget this right at start, you will have to take the whole new unit off again to get access to the key. 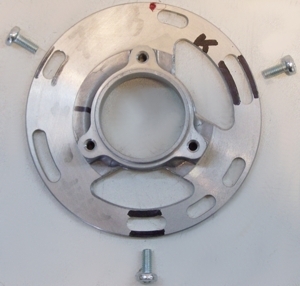 Take a look at the ground plate of the new stator (for better view it is shown without the stator). For the assembly it will be used only 3 of the 7 mounting holes (marked with screws). There is a red ignition marking on the circumference left of the upper left mounting hole. The unit will be delivered preassembled, as in the photo. For mounting the plate at the motor, you have to take off the 3 screws and lift the stator a little (1cm) from its base to gain access to the holder screws below. 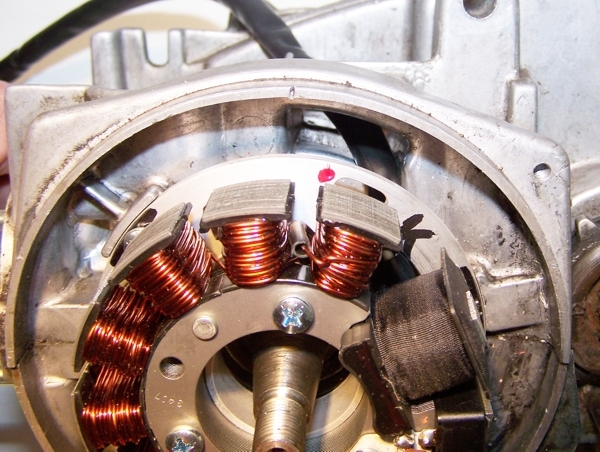 Take care not to damage the paint insulation of the stator coil. Place the ground adapter plate onto the engine and screw it securely down there with the 3 screws M4. Now you have to replace the stator on the ground plate. Take care, that no cable is pinched. The coil has to be fitting good on the ground plate - nearly "hearable engage". If is it ain't so, and the coil fits "soft" on the ground plate, is a cable in the way and there is a risk of damaging by contact of the rotor. 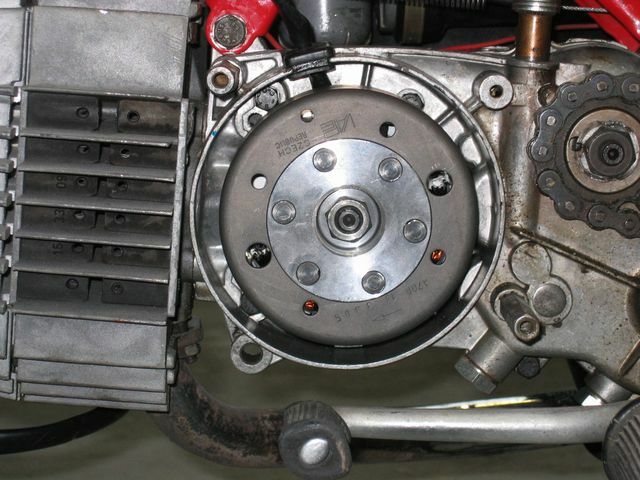 Note, that the stator sits even on the ground plate and no cable is pinched. Otherwise the system will be destroyed or it belongs to malfunctions. Screw down the stator with the 3 screws M4. Unhopefully the ground plate's ignition marking isn't visible now. 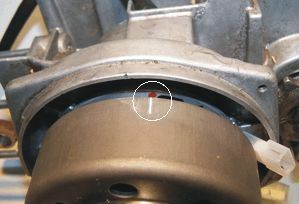 You have to either continue the marking to the motor or notice a marked point at the motor that is visible beyond the rotor. Have a look at the new rotor. You will find on its circumference a small pressed-in line. It is durable, but not well visible, so better highlighten it with some marker pen. This is also a timing mark. It will be used to align the rotor during installation. Remove the spark plugs and bring the piston to advance position. Might be 2mm BTDC. You may use for that the rotor. Attaching it to the crank shaft and turning it until the piston is at ignition point. Take note: The shaft is turning clockwise. The ignition point is 2mm before Top Dead Center (BTDC), so you have to turn anti-clockwise. With the crank in ignition position, pull the rotor off again carefully - make sure that by doing this, you will not alter the crank position - and set the rotor again back onto the crank in such a way that the marking on the rotor aligns with the marking on the ground plate. Press the rotor on the shaft and screw it down with the original mounting screw. Make sure not to modify the crank position during this operation, otherwise you have to repeat the procedure. With that the work on the engine is finished. Put the spark plugs back. Unhopefully is at this system the ignition coil not integrated in the generator, so it has to be installed otherwise. There are many convenient places to mount the coil, we favour (naturally) a place close to the spark plug. Screw the ht-cable into the ignition coil. Then fasten the coil on your selected position. Leave one screw loose, you have to fasten a ground cable here. Fasten the new rectifier/regulator at a convenient place too, maybe under the seat or the side cover. Lay the new generator cable (using the enclosed cable binders) in that way on the frame, that they ending close to the regulator / ignition coil. Take care, that no cable pinched. To facilitate wire exit through the often small openings in the engine casing, the plastic plug of the generator's wiring that leads to the ignition coil has not been put onto the wire terminal. You should place the plug there only once all has been properly installed on the engine side. 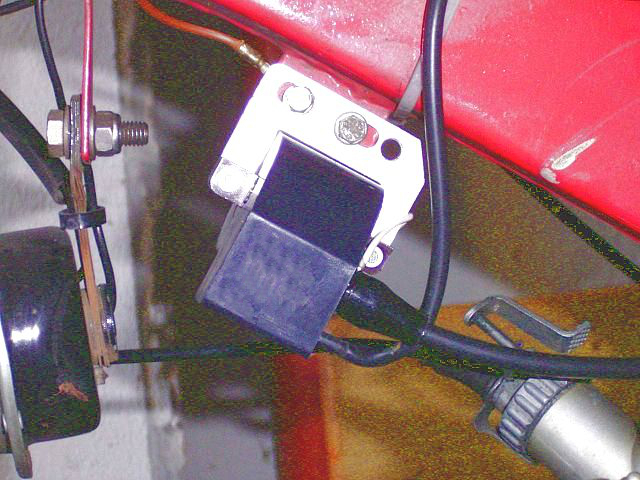 Look for the ignition coil with its female plug and the two wires (red and white). Should you need (or want) to get the terminals out of the plug housing again, enter a paper clip from front next to the terminals and push the little barb aside. Than pull the wire out. The brown wire from the new generator with the round eye terminal has to be screwed directly to the holder frame of the ignition coil (ground). Take note! disrespecting is the most frequent cause for ignition problems !! Without this direct connection the system does not work or not work for long without problems. Please do not rely on the frame for ground. Paint, oil and dirt often prevent good contact! 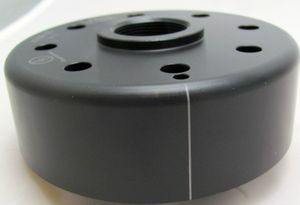 ... should be first introduced into the supplied twin plastic plug housing. This housing connects to the plastic plug at the end of the 2 black wires on the regulator. It does not matter which black is at which side, as there is AC. ... should connect to either battery minus or good ground if there is no battery. Wrong polarity will damage the electronics! ... should connect to either battery 12V PLUS or if there is no battery to the wiring that runs to your consumers (normally main switch intake pin). If you use a battery, make sure that you have a 15A-fuse between battery and vehicle circuitry. There is NO facility for a charge control light without battery this will not work anyway. The regulator has an inbuilt high potency condenser to smoothen voltage. This will make sure that your side indicators (flashers) and horn will work correctly even without battery. Remains the blue (sometimes blue/white) wire at the ignition coil. This is the kill (cut-off) wire. Should you experience ignition failures, disconnect as a first measure this blue wire. In many cases that will permit you to get mobile again (particulars see: technical help)! Connected to ground - it will stop ignition! 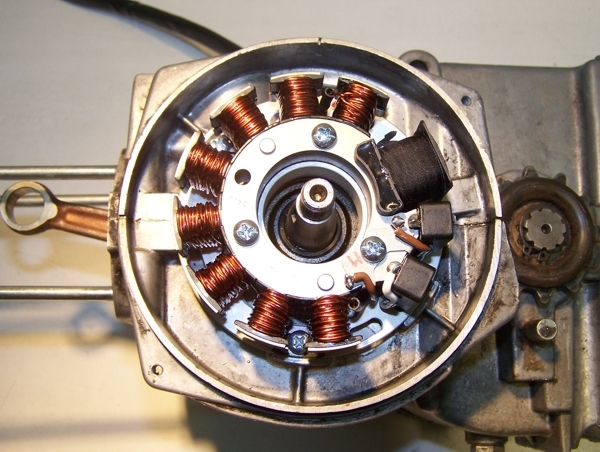 This type of wiring is used in motorcycles which originally already had magneto ignition and therefore switched off by shortcircuiting against ground. Those vehicles have by design a main lock (or some kill switch) that connects a pin to ground when in OFF position (German bikes: pin 2). The blue(/white) wire of the ignition coil will be connected here. In that way the cut-off works like previously. Please do not use any spark amplifying cables, such as "Nology supercables" or "hot wire". This will disturb the system and possibly damage it. ... into the ignition coil and pull over the rubber seal before mounting the coil (it will be easier). Please do use the cable arriving with the pack and not any old cable. You will do yourself a favour to treat your bike to new spark plugs and spark plug sockets (preferably some between 0-2kOhm). Plenty of problems are to be traced back to "apparently good" (even completely "brand-new") sparks plugs, terminals and cables. Do not use spark plugs with an intern suppression resistor. NGK (e.g.) offered such spark plugs coded with an "R" (for resistor). Finally - and before installing the battery and before the first kickstart - please re-check carefully all connections and fitments against the wiring diagram. Do check battery and light bulbs for correct voltage (12V). Should something not work, please consult our trouble-shooting guide on our homepage. As a first step disconnect the blue wire from the coil and re-test. * IMPORTANT: During crank shaft repair the dynamo shaft is often machined and gets shorter. 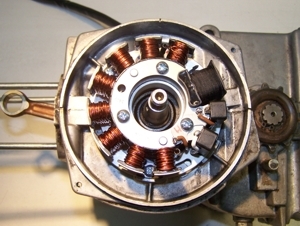 The result is a rotor sitting lower, possibly touching now with its rivets the stator coil. The result is a destroyed stator and ignition failure. For more detail and how to check see (online) here. Safety first! Please observe the general health and safety regulations motor vehicle repair (MVR) as well as the safety information and obligations indicated by the manufacturer of your motorcycle. The timing marks on the material are for general guidance only during first installation. Please check after assembly by suitable means (stroboscope) that settings are correct to prevent damage to the engine or possibly even your health. You alone are responsible for the installation and the correctness of settings. Ignition systems generate high tension! With our material right up to 40,000 Volts! This may, if handled carelessly, not only be painful, but outrightly dangerous. Please do keep a safe distance to the electrode of your spark plug and open high tension cables. Should you need to test spark firing, hold the spark plug socket securely with some well insulating material and push it firmly to solid ground of the engine block. Never pull sparkplug caps when engine is running. Wash your vehicle only with engine at standstill and ignition off. Should you have received in the kit HT cables with a fixed rubber boot(which does not contain a resistor) you might have to use spark plugs with an inbuilt resistor (or replace the cap with one containing a resistor) to comply with your local laws. After installation, please check tightness of all screws, even those preinstalled. If parts get loose during run, there will be inevitably damage to the material. We pre-assemble screws only loosely. Give the newly installed system a chance to work, before you start to check and test values, or what is worse apply changes to it. Our parts have been checked before delivery to you. You will not be able to check much anyway. At any rate do refrain from measuring the electronic components (such as ignition coil, regulator and advance unit). You risk severe damage to the inner electronics there. You will not get any tangible results from the operation anyway. Bear in mind that also your carburetor, your spark plugs and spark plug sockets (even if completely new) might be the reason for malfunction. 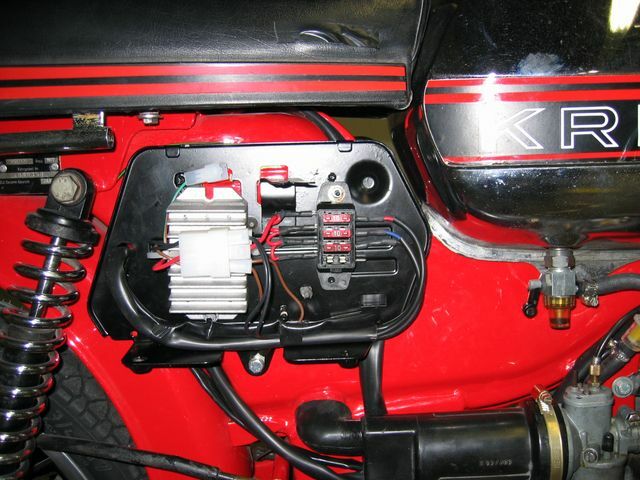 The general experience with our systems is that the carburetor will have to be re-adjusted to lower settings. 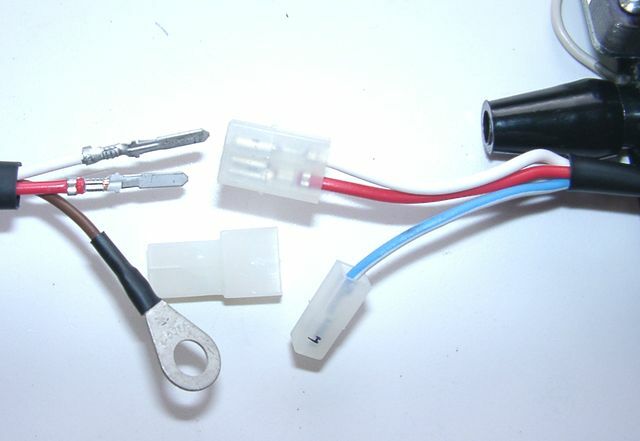 Should the system not start after assembly, first disconnect the blue (or blue/white) cut-off wire directly at the ignition coil (or in some cases advance unit) to eliminate any malfunction in the cut-off circuitry. Check ground connections carefully, make sure there is a good electrical connection between frame and engine block. The spark of classic, points based ignition systems has with about 10,000 Volts comparatively little energy and looks therefore yellow and fat (which however makes it highly visible). The spark from our system is a high energy spark with up to 40,000 Volts and therefore is needle thin focused in form, and blue in colour, which makes it not so visible. Furthermore you get spark only at kick-start operated speeds and not by pushing the kick-lever down slowly with your hand (as you might get with battery based ignitions). Systems using a twin outlet ignition coils have a few peculiarities. Please observe that during tests on one side, the other has either to be connected to an fitted spark plug or securely earthed/grounded. Otherwise there will be no spark on either side. Also with such open exits long and dangerous sparks may fly all over the coil. 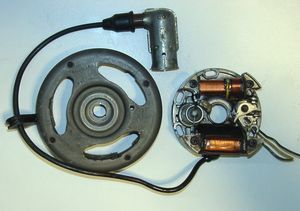 Never do electric arc welding on the bike without completely disconnecting all parts containing semiconductors (ignition coil, regulator, advance) stator and rotor need not be taken off. The same is true for soldering. Before touching electronics disconnect the soldering iron from mains! Never use copper putty on spark plugs. Electronics are very sensitive to wrong polarity. After work on the system, do check correct polarity of the battery and the regulator. 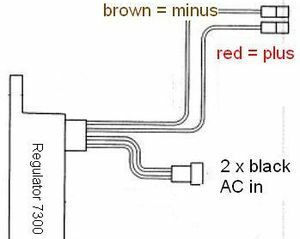 Wrong polarity creates short circuits and will destroy the regulator, the ignition coil and the advance unit. As a rule, wiring will always be colour to colour. Instances, where colour jumps between wires are expressly mentioned in our instructions. # When you handle the new rotor, take care not to damage its magnets. Refrain from direct blows to the circumference of the rotor. When transporting never put the rotor over the stator. Observe our information relative to transport of the material. Do not use spark plug sockets with a resistance of more than 5kOhm. Better use 1 or 2kOhm ones. Bear in mind that spark plug sockets do age and thereby increase their internal resistance. Should an engine start up only when cold, a defective spark plug socket and/or spark plug is very probably the cause. In case of problems check high tension cables too. Never use carbon fibre HT-cables, never use so called "hot wires" which promise to increase spark. It is a good idea to cover the rotor in a thin layer of oil to reduce the risk of corrosion. Never use a claw puller or a hammer to disengage the rotor. Its magnets might become loose in the event. We offer a special puller for disengaging the new rotor again (see assembly instruction)! Should the motorcycle not be in use for some longer period, please disconnect the battery (so existing) to prevent current bleeding through the diodes of the regulator. Though, even a disconnected battery will empty itself after a while. Please do observe these remarks, but at the same time, don't be afraid of the installation process. Remember, that before you, thousands of other customers have successfully installed the system. Enjoy driving your bike with its new electric heart!